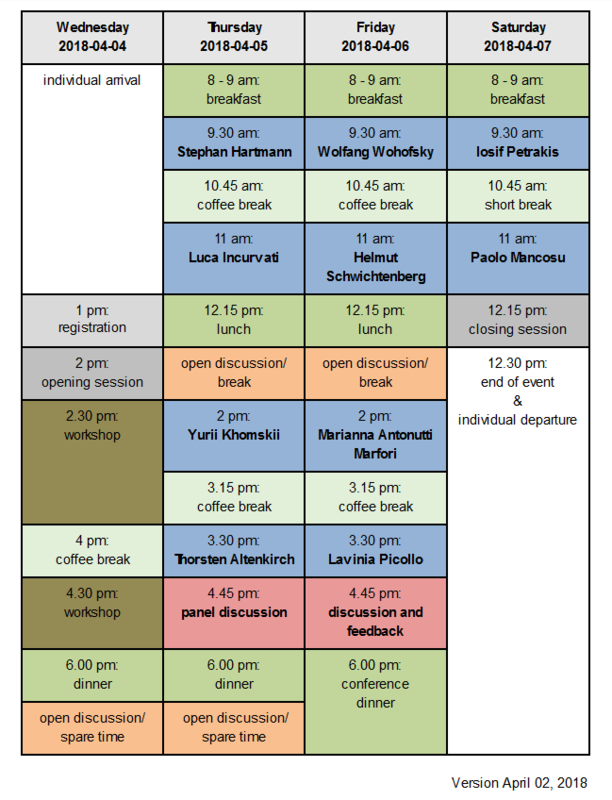 -- Y. Khomskii will talk about "Regularity and Definability in the real Number Continuum"
-- W. Wohofsky will talk about the "Generalized Cantor Space and Compactness"
This conference focuses on the foundations of mathematics, specifically modern views on these foundations. This means that instead of discussing technical details of particular theories, we want to consider the interplay of different foundational systems. What is the stance of today’s top researchers concerning the foundations of mathematics? How do today’s foundational systems relate? Are they mutually exclusive? Can they coexist in a ‘consistent’ way? Which attitude should we adopt towards different foundational systems in mathematics? What is the role of logic (or logics) in today’s debate? Do foundational systems (and formalizations) influence our conception of mathematics? How can a possible future mathematics look like? Meaning: given the current debate, will foundational issues be completely irrelevant? Will they be resolved? This conference is a continuation of a series of logic and formalism conferences. Beside topical discussions, the aim of this conference series is to foster a community of young scientist interested in foundational mathematics and attract the attention of disciplines concerned with similar subject matters. A poster of the workshop can be downloaded here. This event is made possible by the generous support of the ​German Federal Academic Scholarship Foundation (within the framework of Stipendiaten machen Programm), the Max Weber-Programme of the Free State of Bavaria (within the framework of Stipendiaten aktiv! ), the Munich Center for Mathematical Philosophy (MCMP) at Ludwig-Maximilians-Universität München (LMU Munich), the Evert Willem Beth Foundation, the Association for Symbolic Logic (ASL), and the German Society for Analytic Philosophy (GAP). ​The event takes place at the historic Main Building of Ludwig-Maximilians-Universität München/LMU Munich (City Centre Campus). A map of the LMU City Centre Campus can be found here. The conference rooms (including restrooms) are barrier-free. Unfortunately, we cannot offer childcare. But if you want to bring a child with you we will try to find a solution. From the Munich Airport take the S-Bahn (suburban train) line S8 (direction Herrsching) or S1 (direction Ostbahnhof/Munich-East) to Marienplatz. Change trains and take the U-Bahn (underground) line U3 (direction Moosach) or U6 (direction Garching-Forschungszentrum) as far as the Universität stop. Walk along the platform in the train’s direction of travel and use the stairs at this end of the station, which will bring you out directly in front of the LMU Main Building. ​We do not recommend you traveling via the Munich West Airport (FMM, "Allgäu-Airport Memmingen") as it is 120 km (75 miles) away from the City of Munich. From the Munich Central Train Station take the U-Bahn (underground) line U4 (direction Arabellapark) or U5 (direction Neuperlach Süd) to Odeonsplatz. Change trains and take the U-Bahn line U3 (direction Moosach) or U6 (direction Garching-Forschungszentrum) as far as the Universität stop. Walk along the platform in the train’s direction of travel and use the stairs at this end of the station, which will bring you out directly in front of the LMU Main Building. ​The Munich Central Coach Station (ZOB) is located right next to Hackerbrücke station, from where you can take each of the S-Bahn (suburban train) lines S1 to S8 (via Central Train Station/Hauptbahnhof) to Marienplatz. Change trains and take the U-Bahn (underground) line U3 (direction Moosach) or U6 (direction Garching-Forschungszentrum) as far as the Universität stop. Walk along the platform in the train’s direction of travel and use the stairs at this end of the station, which will bring you out directly in front of the LMU Main Building. Since parking facilities near the LMU City Centre Campus are extremely limited, we recommend that you use Munich’s excellent public transportation network. Please check visa/entry requirements, for instance here. If you come from abroad it might be a good idea to spend some time in Munich. While we do not offer a sightseeing program, you might want to plan further touristic activities. Here you might find some useful information.